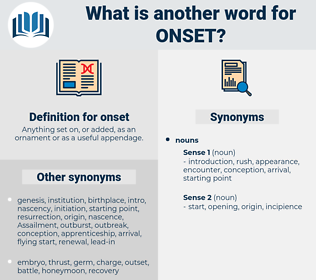 What is another word for onset? Anything set on, or added, as an ornament or as a useful appendage. 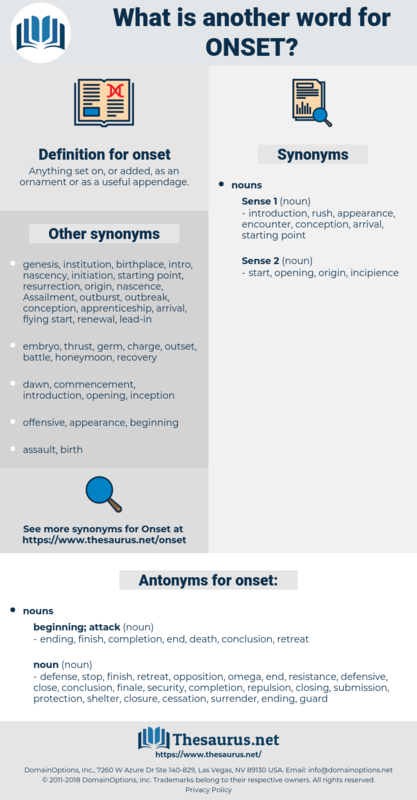 elicitation, installation, incidence, startup, threshold, commencement, onslaught, bursting, dawn, establishment, creation, first, formation, recurrence, demonstration, launching, dawning, disintegration, Symptomatology, season. Emerged, Occurred, developed, Arose, Appeared. outset, advent, appearance, apparition, arrival, eruption, manifestation, introduction, opening, symptom, emergence, triggers, outburst, outbreak, entry. ending, finish, completion, end, death, conclusion, retreat. defensive, protection, cessation, resistance, submission, repulsion, shield, finale, closure, close, omega, windup, surrender, opposition, defense, shelter, security, guard, closing, stop. She was a powerful child, and at the shock of her onset, the seat of Phil's chair gave way, and he " sat through" like little Silver - hair, and came suddenly to the floor, his head and legs sticking up helplessly through the empty frame. The rebels would run away at the first onset, but only to return in overpowering numbers.